Twelve-year-old Rowan is next in line to be Queen; her twin brother, Rhydd, to be Royal Monster Hunter. Rowan would give anything to switch places, but the oldest child is always next in line, even if she is only older by two minutes. She resigns herself to admiring her monster-hunting aunt’s glorious sword and joining her queen mother for boring diplomatic teas. But tragedy shatters the longstanding rule, and Rowan finds herself hunting the most dangerous monster of all: a gryphon. 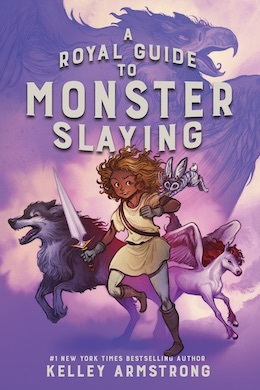 Accompanied by a feisty baby jackalope and a giant wolf that barely tolerates her, Rowan sets off on a journey that will see her join other unlikely allies: a boy with monster-hunting ambitions of his own, and a girl hiding secret motives. It will take all of Rowan’s skills, both physical and diplomatic, to keep this adventure on track. The future of her kingdom depends on it.